I love, love, love when God arranges divine appointments. Many of mine happen while traveling. I’ve written about several in the past. Here’s another example. My hubby and I led a volunteer team to Romania last week. On Tuesday, after we’d completed a camp for youth with life-threatening illnesses, he and I left the team to travel to Berlin via Budapest. A pre-arranged hired driver picked us up. This fellow, who didn’t speak a word of English, drove us approximately one hour to Timisoara where he pulled into the parking lot of a store equivalent to our Home Depot stores in Canada. Without a word, he cruised the parking lot as though looking for someone. Within a minute or so, he found the person for whom he was searching and pulled into the adjacent parking stall. The two drivers shook hands and transferred our suitcases from the first vehicle to the second. He was right! Last March Gene and I traveled to a small Romanian village where International Messengers has a ministry for abandoned women with children. This driver had safely delivered us from Budapest to our destination. As a professional driver, this man transports passengers every day, probably seven days a week. Imagine how many people he’s seen since March. And still he remembered us. Amazing. What’s more amazing is this: The coworker who traveled with us in March had tried to engage him in a conversation of a spiritual nature. He wasn’t responsive then. But yesterday was different. The conversation began when he spoke of the latest happenings in Turkey and France. “The world is a scary place right now,” I said. “Yes, eet ees,” he said. “Yes, of course,” he said. And so, with his permission, I told him about Jesus and how having a relationship with Him gives me courage because His presence and power are always with me. He listened thoughtfully and asked a few questions. Those questions opened the door to talk about God’s promises to those who love Him—especially the promise to wipe away our tears and give us hope. “Yes, yes,” he said softly. Conversation then turned to other things, and it never returned to a spiritual nature. But seeds were sown in his heart’s soil, and we’re trusting God to water them and bring fruit. God works at all times and in all places. He’s constantly drawing men and women to Himself, and He uses people like me and you to help. 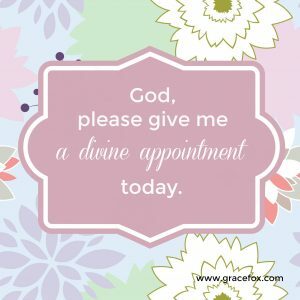 Do you ask Him for divine appointments? If not, why not begin now? His answers will never cease to amaze you. What does Childlike Faith in God Look Like? 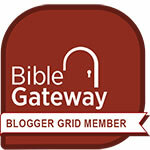 What’s the God-Given Role of Every Jesus Follower?